The United States Capitol was built upon the idea that a government can be assembled with the consent of citizens and absent the whims of dictators. The Capitol is both aesthetically pleasing and functional, deriving elements and architectural characteristics from the ancient Greeks and Romans. Although most state capitol buildings reflect the same ideals, these 8 stand out for their somewhat unusual decorative toppers. Four different state capitol buildings have eagles atop their domes, but none quite like the West Virginia state capitol eagle. This particular bird perches atop a 25-foot bronze spire built on a 34-foot lantern at the top of the dome. The eagle also boasts red marble eyes. The better to see you with, my pretty. Atop Rhode Island’s capitol dome stands the Independent Man. Independently dressed in a bearskin loincloth and holding a spear and an anchor, the man was supposed to be modeled after the founder of Rhode Island, Roger Williams. When no one could agree on what he looked like, a generic-but-independent man was cast instead. Maryland’s capitol dome boasts an homage to Benjamin Franklin in the form of a 28-foot-tall lightning rod, constructed and grounded to Franklin’s specifications. The rod goes through the center of a 5-foot-tall acorn, symbolizing the strength and potential of an oak tree. Though the oak tree has a commanding amount of potential, the acorn was actually constructed from 31 pieces of cypress. The lady named “Wisconsin” stands 15 feet high and weighs 3 tons as she moves the state “Forward” (its motto) atop the capitol dome. In one hand she holds a globe with an eagle on top and on her helmet sits the state animal, the badger. This particular badger is not clad in a red and white striped sweater like the University of Wisconsin mascot, Bucky Badger. Minnesota’s state capitol was originally designed with St. Peter’s Basilica in Rome in mind. What really sets Minnesota’s dome apart isn’t atop the dome, but at its base. 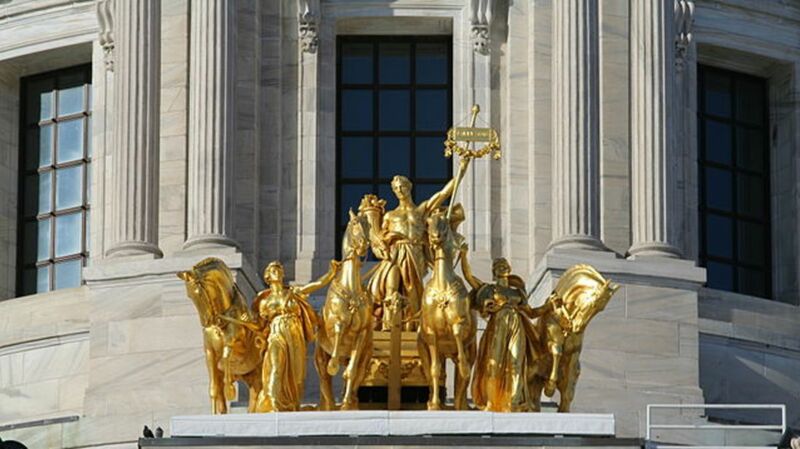 Twelve marble eagles surround the base of the dome, as well as a gleaming gold sculpture known as Progress of the State, but commonly referred to as the “Quadriga.” The sculpture’s four horses represent the powers of nature: earth, wind, fire, and water. Think Captain Planet, but with more Chariots of Fire. Below the Quadriga are six large figures sculpted in marble called the Virtues, which represent bounty, courage, integrity, prudence, truth, and wisdom. The 23-foot tall “Oregon Pioneer” might be the best looking statue of all state capitol statues. The “Brawny Woodsman,” as he is sometimes called, boasts a beard and a healthy head of a hair, and holds an ax in one hand while a gilded tarp hangs over his other shoulder. After 37 years of construction, the Kansas state capitol was finally completed in 1903. However, the funding for the statue for the top of the dome wasn’t approved until 1984, a design didn’t follow until 1988, and the statue wasn’t installed until 2002. The sculpture of a Kansa warrior called “Ad Astra” stands 22 feet tall and was taken from the state’s motto, “Ad astra per aspera,” meaning "To the stars through difficulties." Hawaii’s state capitol, to no one’s surprise, looks like a resort. The legislative chambers were designed to mimic volcanos, so the interior walls curve upward; the exterior columns are carved in the shape of palm trees, and the building is surrounded by a reflecting pool. So, what’s on top? Nothing—it’s a crater. In the Hawaii capitol building, the sky is the rotunda.